Cadillac has won the 57th running of the Rolex 24 Hours at Daytona. 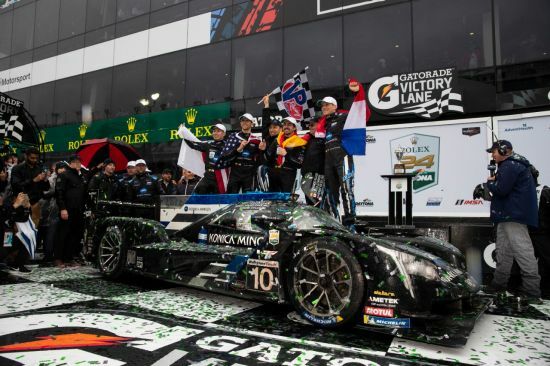 The Konica Minolta Cadillac team soldiered through 24 hours of start-and-stop racing to give the Cadillac brand a Rolex 24 hat trick with their third win in as many years. Wayne Taylor led Konica Minolta Cadillac team wins second Rolex 24 with Cadillac. Whelen Engineering Cadillac second, last year’s prototype champions. Hat trick for Cadillac, third Rolex 24 Hour victory in a row. JDC/Miller Motorsports and Juncos Racing, new to Cadillac, have quality starts. Rain played a major role in the race. At the start of the twice-around-the-clock classic at Daytona International Speedway, the six Cadillac DPi-V.R teams had their individual challenges throughout the event. Cool temperatures during the day Saturday and into the evening turned to rain at 5:30 a.m. The rain ignited the two-time Formula 1 champion Fernando Alonso behind the wheel of the No. 10 Konica Minolta Cadillac as he passed the two Acura prototypes ahead of him to take the lead some 35-minutes later. Soon after, IMSA WeatherTech Championship officials flew the red flag. The race was stopped for 1:45. When the race restarted, the Wayne Taylor led Cadillac team kept the lead after Alonso turned the controls over to Jordan Taylor. With three hours remaining, it was Jordan Taylor versus Felipe Nasr driving the No. 31 Whelen Engineering Cadillac DPi-V.R. The duo drove their V-Performance powered prototypes head-to-head in rainy conditions to the delight of the large but damp crowd at Daytona. Soon after Taylor handed the car back to Alonso, the race was red flagged and stopped again at 12:40 p.m. At 2:26 p.m. IMSA waved the checkered flag as the field was parked under a red flag to end the race. The win by the Konica Minolta Cadillac team is the brand’s third in as many years. The Taylor led team won in 2017, the first year of the IMSA DPi cars. Then, Mustang Sampling Cadillac took the win last year. “The win is a milestone for me. I’ve won at Nurburgring and Spa, this is an overall victory. Also racing with an iconic team and teammates. I am very proud. I came from having no drive in 2012 to winning the Rolex 24 in 2019. The IMSA WeatherTech Sport Car Championship next heads to Sebring, Florida March 13-16 for the Mobil 1 Twelve Hours of Sebring Presented By Advance Auto Parts. The Cadillac DPi-V.R teams won every title in the inaugural season of the IMSA DPi formula including: Cadillac wins DPi manufacturer championship; Cadillac wins TPNAEC (Tequila Patrón North American Endurance Cup) manufacturer title; Jordan and Ricky Taylor 2017 IMSA WeatherTech DPi driver champions; Konica Minolta Cadillac team champions; Mustang Sampling Cadillac drivers Joao Barbosa, Christian Fittipaldi and Filipe Albuquerque won the TPNAEC DPi driver championship; Mustang Sampling Cadillac won the TPNAEC DPi team championship; Whelen Engineering drivers Dane Cameron and Eric Curran finish second in the driver’s championship; Mustang Sampling Cadillac drivers Joao Barbosa and Christian Fittipaldi finish third in the driver’s championship; Cadillac teams combine to win seven races in 2017: Rolex 24 Hours at Daytona, Twelve Hours of Sebring, Long Beach, Circuit of the Americas, Detroit, Watkins Glen, and Canadian Tire Motorsport Park. In 2018 the Mustang Sampling Cadillac DPi-V.R won the Rolex 24 Hours at Daytona; Cadillac won the IMSA Prototype Manufacturer Championship; Whelen Engineering Cadillac drivers Eric Curran and Felipe Nasr win IMSA Prototype Drivers’ Championship; Whelen Engineering Cadillac wins the IMSA Prototype Team Championship; Cadillac wins Tequila Patron North American Endurance Cup (TPNAEC) Manufacturer Championship; Whelen Engineering Cadillac drivers Eric Curran and Felipe Nasr win TPNAEC Drivers’ Championship; Whelen Engineering Cadillac wins TPNAEC team championship. A leading luxury auto brand since 1902, Cadillac is growing globally, driven by an expanding product portfolio that features distinctive design and technology. Today Cadillac is growing globally, driven by an expanding product portfolio featuring distinctive design and technology. More information on Cadillac appears at www.cadillac.com. Cadillac's media website with information, images and video can be found at media.cadillac.com.